In November and December 1967, Martin Luther King, Jr., delivered five lectures for the renowned Canadian Broadcasting Corporations' Massey Lecture Series. 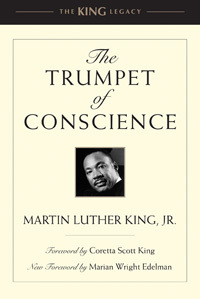 The collection was immediately released by the CBC under the title Conscience for Change, but after King's assassination, in 1968, the book was republished by Harper & Row as The Trumpet of Conscience. Each oration found here encompasses a distinct theme and speaks prophetically to today's perils, addressing issues of racial equality, conscience and war, the mobilization of young people, and nonviolence. "A Christmas Sermon on Peace," a powerful concluding speech that was a live broadcast of his 1967 Christmas Eve sermon at Ebenezer Baptist Church, illuminates King's long-term vision of nonviolence as a path to world peace and contains many of his memorable oratorical set pieces.